Chevy Vega on North Ohio Ave.
Back in March of 2013, I wrote about the progression of cars I drove in my band days. It started with a picture of the old MG Midget I had while I was with The Contents Are: and ended with a shot of the van that towed our equipment trailer up until the very end. 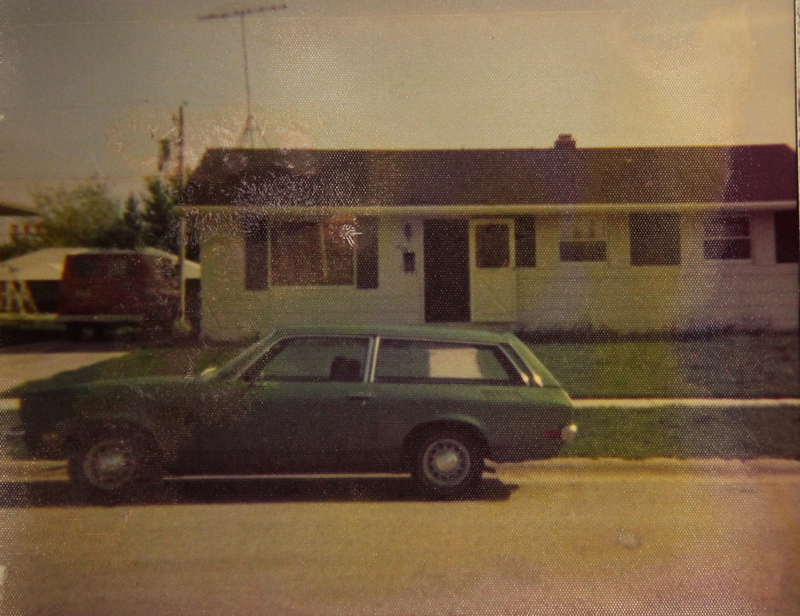 Recently a photo surfaced of the old “puke” green Chevy Vega I drove when I first joined Silver Laughter. We didn’t have it very long because it was the model with one of the early aluminum engines that warped when it reached high temperatures and start leaking water and oil. Here it is in all its glory on Ohio Street just across from my parents’ house. Imagine this car packed to the gills with clothes and equipment and a small Styrofoam sailboat lashed to the roof rack speeding down the road toward some unknown job! I am pretty sure the auto didn’t last more than a few months before we had to ditch it.